The City Lake Hotel lies in Neihu District. Its proximity to Neihu Technology Park and Nangang Exhibition Center make it ideal for business travelers. That said, it can still be enjoyed by transients who can appreciate the nearby Egret Lake and Dahu Park. City Lake is on the same MRT line as Songshan Airport (brown) and only a few stops away from the blue line that goes toward Taipei Main Station. 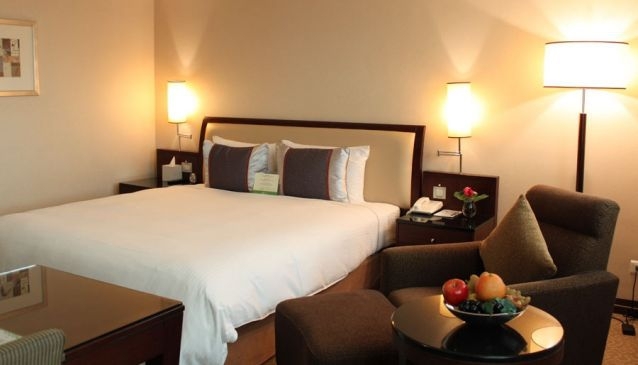 Rooms range from Standard Single & King, to Deluxe, to Business Suite. All rooms have internet, safes, DVD player, and free water and soda. Guests can use the business center, salon, gym, and laundry. There is even free parking! A meeting rooms is available for groups needing the space. For dining, visit the on-site Chinese restaurant or cocktail lounge if not wanting to leave the hotel. Check their website for various promotions for certain dates.